Back in the 2000s, universal remotes were all the rage. You remember them: programmable remotes that could take care of all your devices. Of course back then everyone had 6 or 7 things connected, from a VCR to a cassette deck. Today, things have changed. Today you probably have a TV with a soundbar, plus a satellite receiver and maybe a streaming box (if streaming isn’t built into the TV.) HDMI Control is a technology that lets your devices talk to each other more easily. For example, if you turn on your DIRECTV receiver, the TV will automatically turn on and switch to the right input. (Here’s a tutorial that will help you set it up on DIRECTV.) Once it’s set up, all you have to do is pick up the remote for the device you’re using (like the DIRECTV remote in this case,) turn it on and start watching. Universal remotes are so, 2000s. Most people today have moved away from universal remotes. They’re hard to program and they never quite have the right buttons. There’s a better way. Most home theater enthusiasts have moved to IP remotes. An IP remote communicates over your home networking so you don’t have to point the device. The remote can be something purpose-built or, more often it’s an app on your phone. You probably have your phone in your hand anyway while you’re watching, why not use it as a remote? 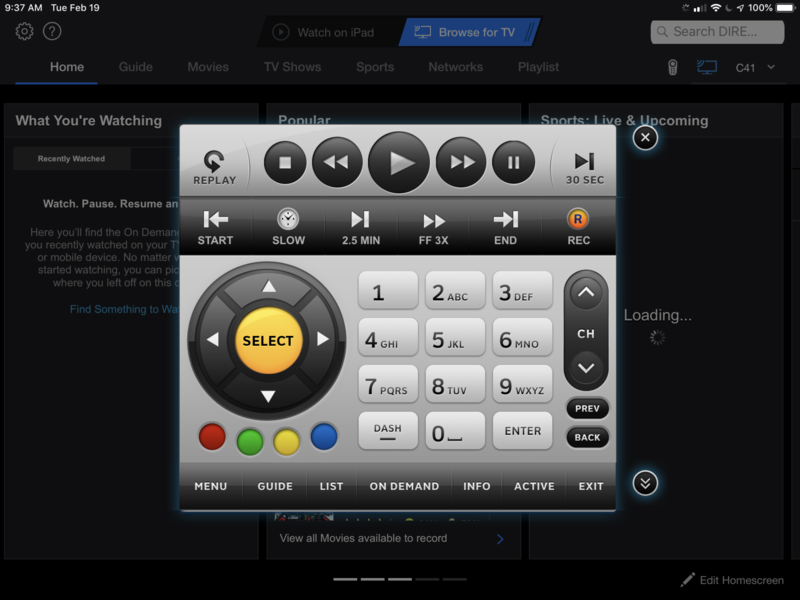 I think the best IP remote for DIRECTV is the one that’s built into the free app for smartphones and tablets. It’s full-featured and gives you everything you need. Let’s take a closer look. The best part of the app is honestly the widget you can use even without opening it. You’ll see it at the bottom of this screen capture. Not only do you get information on what’s playing but you get basic remote control features as well. Widgets are easy to pull up and launch quickly. 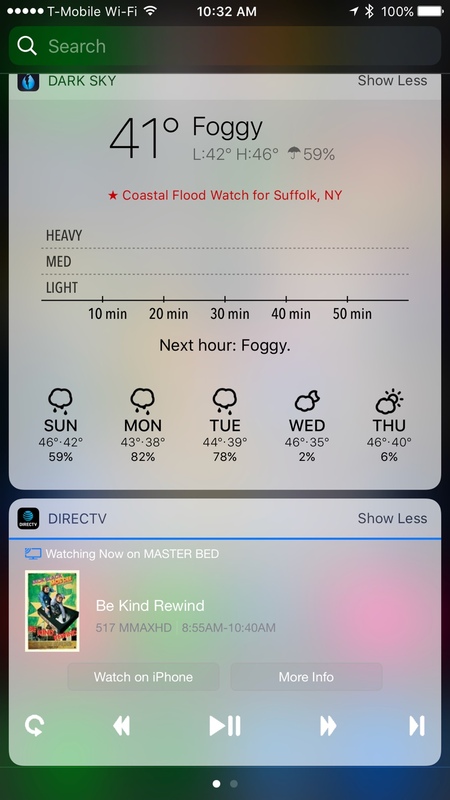 I have noticed sometimes the iOS widget won’t find a receiver but it’s pretty rare. Once again you get a full complement of everything you need and it’s all right there at your fingertips. You can even swipe up to get a number pad. Second of all it gives you dedicated buttons that don’t appear on the DIRECTV remote like STOP, FF-3X, and Slow. It also gives you color buttons and an ACTIVE button but that’s simply due to the fact it was designed many years ago. Most of those color buttons do nothing and the ACTIVE channel is just a mess. But you could definitely go there if you wanted to. Personally I have a cheap Android tablet that always has this app running. That way all I have to do is unlock it and I have the greatest remote ever made for DIRECTV. I keep it set so it stays unlocked for 15 minutes which is usually enough time that I can use it anytime I want. Yes, I do have to charge it more frequently but that’s not a huge deal. I keep the brightness down and I can usually make it through a night’s TV watching. The whole setup cost me about $50 for the tablet and it’s the best remote I’ve had. What do the Legacy Ports do on a DIRECTV multiswitch? NICE AND EASY: Can you use rechargeable batteries in your DIRECTV remote?